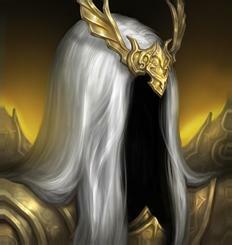 Inarius - Villain or ally in D3X2? Greetings, dear readers! My latest Diablo 3 speculation blog was meant to be the last before gamescom; however, recent developments prompted me to write another one with the world's biggest gaming fair just 10 days away. About a week ago, a user called "Geheimnis" claimed to have information that an expansion called The Dark Prophet has been "leaked" and that it is for World of WarCraft, Blizzard's MMO. You can learn more about this here on reddit. Furthermore, the presence of WoW lead designer Ion Hazzikostas and the French WoW fansite Mamytwink at gamescom were interpreted as sign that there's indeed a big announcement coming. Before I continue with my own speculations, I want to clear up a couple of things, especially for the WoW fans. WoW's fifth expansion, Warlords of Draenor, just recently had the huge Fury of Hellfire patch 6.2 featuring a band-new zone, factions, quests, and the biggest raid of the expansion so far. Patch 6.2.1, which introduces flying in Draenor, is currently on the PTR and should be released shortly. A patch of this size is a big thing even for Blizzard, and with all the online-marketing for patch 6.2 being in full swing so close to gamescom, it's really just wishful thinking that Blizzard announces the next WoW expansion in 10 days. While Blizzard has - with over 500 demo stations - its biggest gaming fair presence ever at this year's gamesom, many of these stations will just have patch 6.2 on them with Ion Hazzikostas answering fan questions about Hellfire Citadel and Mamytwink to report about it. Sorry if I've just bursted your bubbles, dear WoW fans, but a WOWX6 announcement just won't happen here. 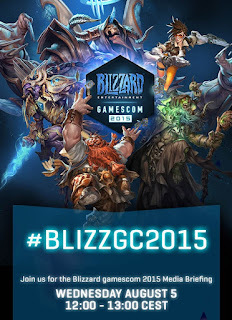 BlizzCon 2015, on the other hand, is a prime candidate for it. All that said, the author of the "leak" (who seems to have a Blizzard source because he had "forecast" details of Warlords of Draenor before its announcement) might just have been creative on the Queen Azshara theme, which ranks high among fans as potential WoW expansion. In fact, his concepts pretty much read like the fan-fiction that Ian "The Red Shirt Guy" Bates wrote up a week ago for the Blizzplanet fansite. However, assuming that there is indeed a reliable source and that the name or trademark "The Dark Prophet" was mentioned in connection with Blizzard, there's another possibilty, which seems to be much more plausible with respect to the normal Blizzard product release schedule: "The Dark Prophet" (or "Prophet of the Dark") could be the title of the second Diablo 3 expansion! The Reaper of Souls (RoS or D3X1 for short) expansion ends with a pretty solid hint at the possible fate of the Nephalem (you, the player) in the not-so-far future. The following video is a complete recap of the Angel of Death quest including the final ingame cinematic, which can not only be looked at as ending of RoS but also as teaser and prologue of the second expansion a.k.a. D3X2. This are Tyrael's famous last words: "...but within him [the nephalem] beats a mortal heart, that will one day be tempted to corruption. On that day, will he have the strength to resist, or will he be our doom?" During the events of Diablo 3, Diablo, the Lord of Terror, was able to combine - with the help of the witch Adria - the essences of the other two Prime Evils and the four Lesser Evils through the Black Soulstone into his own "body", becoming a singular Prime Evil. While he was defeated by the Nephalem (at the end of Diablo 3), his spirit returned to the Black Soulstone, and through the destruction of the stone at the hands of Malthael during the final encounter in RoS (see the "Angel of Death" video above), he was released into creation once more. So, this is where we stand right now: Diablo is free again, and the Black Soulstone, which "forged" his last incarnation as "Singular Prime Evil", is destroyed. The Nephalem (you, the player) has overcome Evil in numerous forms, you are more powerful than ever, and Diablo has to find other means to subdue you. It remains to be seen how the Diablo team develops the lore further in D3X2. 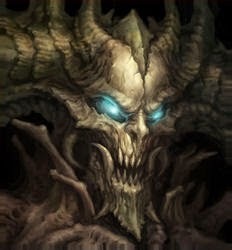 Is the "Singular Prime Evil" Diablo able to maintain his form now that the Black Soulstone, an artefact of incredible power, is destroyed? Is the stone destroyed at all, or have its shards landed somewhere on Sanctuary, just like the shards of Tyrael's sword did in Diablo 3? Is the third Diablo possibly decomposed again into the Great and Lesser Evils? With "The Dark Prophet" being a possible expansion title, an important character comes into play: Inarius, the Prophet (title) and formerly an archangel of the High Heavens, whose actions would lead to the creation of Sanctuary and the Nephalem. After eons of war and witnessing countless acts of brutality in the Eternal Conflict a.k.a. "The Great Conflict", Inarius came to the conclusion that the conflict was unjust and that his part in it had to come to an end. Inarius found other angels and demons, who also sought escape from the never-ending war fate, and together he and his renegades managed to gain access to the Worldstone. With its aid, they created the world Sanctuary in another, safe pocket dimension. Eventually, the archangel and a demon called Lilith mated and created offspring. In time, other renegade demons and angels did likewise and produced offspring of their own. Thus, the Nephalem were born - the children of both angels and demons, yet a new entity in their own right. Peace didn't last long, though, because the new species had power that surpassed that of angel or demon, and the union of angels and demons would be deemed the ultimate blasphemy by the Great Evils and Angiris Council. Inarius came to the conclusion that the Nephalem were "abominations" and declared that they be exterminated. Lilith, driven into a mad frenzy by the threat of her children's extinction, began slaughtering her fellow renegades, which eventually led to her banishment into the Void through Inarius. Inarius then attuned the Worldstone to cause the powers of the Nephalem to diminish over time, leading to what the humans are in Sanctuary these days. Mephisto took Inarius to the Burning Hells. He bound Inarius with tremendous chains and slowly tore the wings from the back of the angel. Great barbed hooks were then used to stretch out his once glowing skin and his features were distorted by vile powers. Now, Inarius is said to be trapped in Hell within a chamber of mirrors, his eyelids torn from his face as he is forced to gaze upon his misshapen form for all eternity. This remains true to this day. With the Nephalem back in full swing after the events of RoS, who if not Inarius and Lilith, who once gave birth to the super-human species, could be the perfect antagonist couple for expansion 2? Both Inarius and Lilith could be freed, and we'll suddenly find ourselves in a scenario that makes us walk the line between hero and villain. Both the Burning Hells and and the High Heavens have a vital interest in gaining the upper hand in the Eternal Conflict. However, it's hard to foresee how the story develops after RoS because Diablo's current state as Singular Prime Evil including Mephisto's essence is, well, complicated. Also, how could the poor soul Leah possibly come back into play here? There are indicators, though, that we'll go back deep into the history of the Diablo universe, which alone is a very exciting outlook. Necromancer, Druid, or "Necruid" as next class? 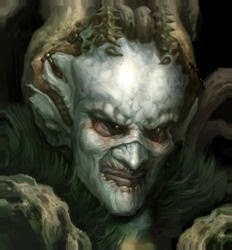 When we talk about Inarius and Lilith, we must also mention Rathma, a first generation Nephalem and the progenitor of the Priests of Rathma, also known as the Necromancers. He is the son of Lilith and Inarius and not on good terms with his parents, as Lilith killed the rebel angels and demons only to use the Nephalem's power for her own ends, while Inarius believed that the Nephalem are "abominations" that should be destroyed. 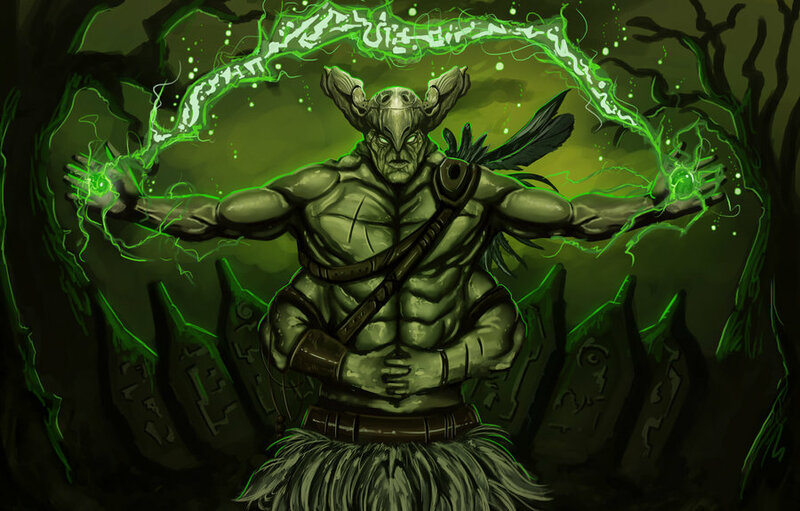 Rathma and the other members of the first generation, such as the Immortal King Bul-Kathos and his Druid brother Vasily, retained their supernatural powers. While the Necromancer's goal is to keep the balance between the Burning Hells and the High Heavens and prevent either from interfering too much in Sanctuary's affairs, the Barbarians and their Druid brothers seek to protect Mount Arreat and the Worldstone. In a potential Inarius vs. Lilith vs. Nephalem scenario, it's therefore well possible that either the Necromancer or the Druid will be playable as next class in D3X2. Both have a huge fan base, and if Blizzard goes balls to the wall with the next expansion, we might see even both classes or a "Necruid" (Necro-Druid) hybrid. Also, the Diablo 3 Patch 2.3 is currently online on the PTR, and its highlights - the new Ruins of ‪‎Sescheron‬ zone in the Barbarian Highlands and the new, powerful Kanai‬'s Cube‪ - fit perfectly in here as well. The ruins including the third Immortal King in the throne room (with the suspicious error message "The time is not right") seem to have lore hints to what's coming next, and the new meta/power creep introduced through the cube has the character of a pre-expansion system patch. We definitely need more power for the tasks that lie ahead of us! Blizzard's subtle hint who the star of this year's show is? Everything that must be said about the upcoming expansion StarCraft 2: Legacy of the Void has been said, and the cinematic trailer has been shown. The game is currently in beta, and more news will likely follow at BlizzCon in November, shortly before its release. You can play LotV in the demo area at gamescom. A lot of info, the trailer, and gameplay videos for the upcoming shooter Overwatch have been revealed already since BlizzCon 2014. The game will have its beta in fall this year, and we might get a beta date at gamescom. Other big news, if any, will likely follow at BlizzCon. You can play Overwatch in the demo area at gamescom. The upcoming expansion Hearthstone: The Grand Tournament has been revealed a few days ago, and it will be released in August. We'll likely get the exact release date at gamescom. Other big news are not expected here. 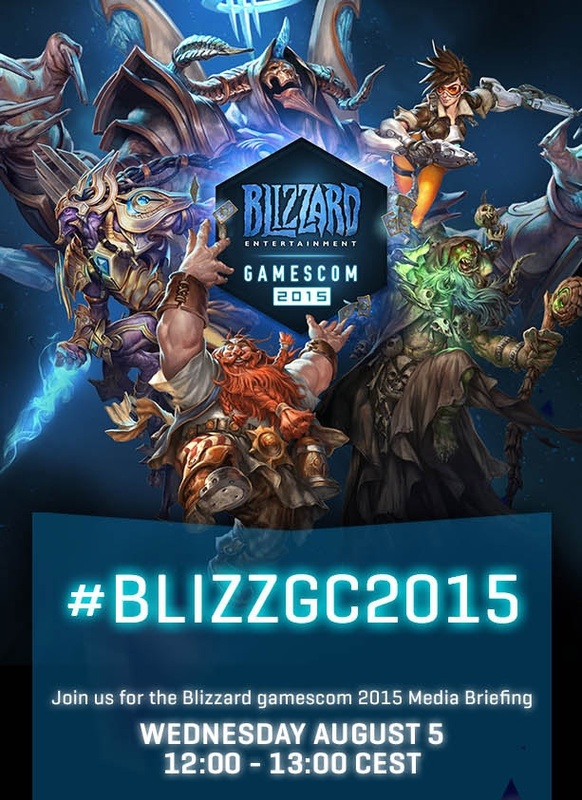 You can play Hearthstone in the demo area at gamescom. The current expansion World of WarCraft: Warlords of Draenor just got a huge update, the Fury of Hellfire patch 6.2 featuring a new zone and the expansion's main raid. The next update, which introduces flying in Draenor, is already on the PTR, and it will be released shortly. Other big news, if any, will likely follow at BlizzCon. You can play WoW in the demo area at gamescom, and WoW lead designer Ion Hazzikostas will be there to answer fan(site) and press questions. Blizzard's latest baby Heroes of the Storm has been released in June, and it just got its first big update: The Eternal Conflict from the Diablo universe featuring new maps, heroes and skins. I expect more infos about the upcoming Monk hero, the new Novazon skin, and the not yet revealed Diablo hero. You can play HotS in the demo area at gamescom. The first Diablo 3 expansion, Reaper of Souls, has been revealed 2 years ago at gamescom 2013 during a press conference, and while you cannot play Diablo 3 in the demo area at gamescom this year, the game is the prime candidate for a big announcement, the expansion 2. As mentioned earlier in this blog, the upcoming patch 2.3 certainly has the character of a pre-expansion system patch with its new meta/power creep, and the current "Eternal Conflict" HotS promotion is so close to the lore around Inarius, Lilith, and the creation of Sanctuary and the Nephalem, that it all seems to point in that direction. I would be very surprised if Blizzard lets that opportunity slip; gamescom is too big to be ignored for a major announcement, and more than 2 years between expansion announcements would be unusual as well.